Choosing the right office chair can mean that you’re able to complete your work without pain or strain on the body that can come from sitting in an uncomfortable chair. There are many options when it comes to different office chairs. They come in a variety of styles and colors. 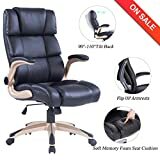 There are some office chairs that are cheap but the higher end chairs often come with better features and more support. If you experience back pain or other issues that come from sitting all day in an office chair, it may be time to upgrade to a better option. Office chairs are available in many styles and colors. You can easily find one that will coordinate with your office decor. Whether you work from home or in a professional workplace, it’s important to have a chair that gives you the support you need. An office chair should allow you to sit upright comfortably without slouching. A well-made chair will be the ideal addition to your office as it will help you get your work done without back pain. The following is a list of the best high-end office chairs. 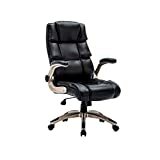 The OFFICE FACTOR Executive Chair has a fully adjustable design. This chair can conform to, and support, your body so you can sit for extended periods of time without experiencing pain. It has a mesh back that offers a sleek look with plenty of back support. This office chair from Office Factor allows you to slide the seat forward or backward for comfort. It also has adjustments for tilting the chair. It’s equipped with a 5 point base with casters so you have a sturdy chair that can easily be moved around as needed. This chair works for people of all heights as you can adjust the height of the chair as needed. The RESPAWN-105 Racing Style Gaming Chair has a sleek and ergonomic design for comfort and style in any office setting. 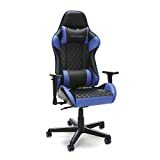 This chair has a steel tube frame that has been encased in foam for durability to last through many hours of gaming or work at your desk. This stylish racing-style chair from RESPAWN is upholstered in bonded leather which makes it easy to wipe clean. It has a full 360 degrees rotation and allows you to adjust the armrests for comfort. You can also raise or lower the chair for your height preference. The adjustable headrest and lumbar support help prevent pain in the back and neck when sitting for extended periods of time. The RESPAWN-100 Racing Style Chair is very similar to the previously mentioned RESPAWN-105. This chair comes in a stylish blue color and is also available in several other color options. 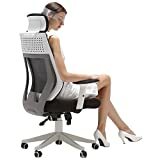 It has support for the lower back and the neck area to help prevent pain and strain on the upper body while you’re sitting for long periods of time. This ergonomically designed chair has a steel tube frame designed for durability. 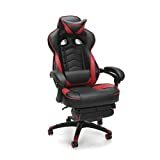 It comes with full customization options that allows you to adjust the chair height for your comfort and also allows you to adjust the chair depth and the armrests. The HEALGEN Gaming Chair with Footrest has a sleek racing-style design for a stylish look in your office at home or in the workplace. 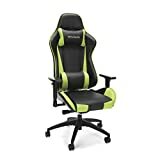 This chair works well for those who sit at their desk for extended periods time for gaming or for work. It has an extendable footrest that is easy to pull out so you can rest your legs and feet while sitting. This chair can recline so that you can relax in your office chair. It has a heavy duty base for support and stability. The casters have a smooth design that makes them quiet when you move and also helps to prevent damage to your floors. The chair also includes a lower back support. The RESPAWN-200 Racing Style Gaming Chair has a stylish and modern design. 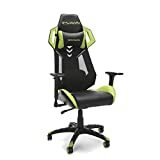 This chair provides both luxury and comfort for working or gaming. It has the option for full 360 degrees swivel to give you range of motion when you’re working. This chair from RESPAWN has a lightweight design and temperature control mesh panels that helps prevent you from overheating. You can adjust the seat for height and adjust the armrests for support and comfort. The chair offers back support and an adjustable headrest to prevent back and neck pain. The Hbada Ergonomic Mesh Office Chair has a breathable mesh back that helps keep you cool and comfortable while you work. This chair has an ergonomic design that helps to fully support the lumbar and the neck area. It has a headrest and is designed to meet the curves of the back for a pain and pressure free workday. This chair has a maximum weight limit of 400 pounds. It’s white and gray in color with a minimalistic design. The seat is made of durable foam that is supportive and comfortable. The chair is covered with a long-lasting PU material that can be wiped clean as needed. The KADIRYA Ergonomic High Back Leather Office Chair is covered in a durable and comfortable PU leather material. This material is easy to keep clean and designed to withstand heavy usage. This chair has simple pneumatic controls so you can raise or lower the chair for comfort based on your height. This office chair can tilt back for relaxation during a long work day. It has a double-padded contoured seat for support for the back and upper body. The chair arms have a convenient flip-up design and the chair is equipped with smooth rolling casters so you can quietly move the chair around without disturbing others. The RESPAWN-110 Racing Style Gaming Chair has a segmented and padded design that provides full support for all areas of the back. This ergonomically designed chair comes with an adjustable headrest and lumbar pillows to provide comfort for the entire upper body. The armrests on the chair are also adjustable for a completely customized office chair for working or gaming. This chair from RESPAWN has a stylish design that mimics the look of a car racing seat. It is covered in a durable material that can withstand spills and be wiped clean easily. The chair has an extended footrest so that you can recline for relaxation. The VANBOW Reclining Office Chair has a professional appearance that work work well in a formal office setting. This chair has a highback design for the ultimate in lumbar support. The waterfall edge of the seat helps with comfort when sitting for long periods of time. This chair from VANBOW has thick padding allover and is covered in a bonded leather material for long-lasting durability. The chair has nylon rolling casters that have a smooth movement that won’t scratch your floors. It has a footrest underneath that can be pulled out for relaxation when you want to recline in your chair to nap or rest. The VANBOW High Back Memory Foam Leather Office Chair has a high back design for maximum lumbar support. This chair has a memory foam seat that helps support the entire upper body while you sit for extended periods of time. The chair has armrests that are able to flip up for convenience. This chair from VANBOW can recline to several different positions and it has a locking mechanism to keep it at the desired reclining level. The bonded leather material is long-lasting and easy to clean. The nylon base and nylon rolling casters provide you with a sturdy support that allows you to easily move the chair around as needed. When you’re shopping for an office chair you may feel overwhelmed at all the different options available. Office chairs come in many different colors and at many different prices. But if you’re looking for a quality chair that is designed to last and can provide you with the comfort and support needed for a long day of work, you may want to consider a high-end office chair. These come at higher prices than standard chairs but they tend to have more features and are made with higher quality materials. A high-end office chair may come with several features that allow you to fully adjust the chair for comfort. Some have adjustable armrests while others may have a footrest that can be folded out when you need it. If you experience back or neck pain you may want to choose an office chair that has adjustable support specifically for those areas. It’s helpful to read online consumer reviews before you purchase your chair as this can help you find the best option for your needs.